Alphacool are a dominant name within the enthusiast watercooling segment, offering custom parts for bespoke loops as well as producing parts for OEMs, but not wishing to lose out on the all-in-one market, Alphacool released their Eisbaer range. Today we look at the Eisbaer LT, the 2nd generation of semi-customisable watercooling loop from Alphacool. Featuring an all-copper radiator, with twice the heat capacity of aluminium for better cooling, performance should be good, and pairing that with a cross slot structured cooler and pump, we should be on to a winner here. Other features include kink-resistant tubing for routing in tight cases and Eiswind 120mm fans which provide substantial static pressure, specifically useful on watercooling radiators. All of that is well and good, and fairly run of the mill for an all-in-one cooling loop, but the fancy feature here is the ability to add in components via the modular design. Using a G1/4” thread, additional radiators or heatsinks can be installed into the loop for devices like GPUs or motherboard cooling. At £84.99 in the UK, ($94.99 in the US and $122.99 in Australia), the cooling loop is neither expensive nor cheap, though the performance and usability of the expansion options will show how worthy it is of the price tag. 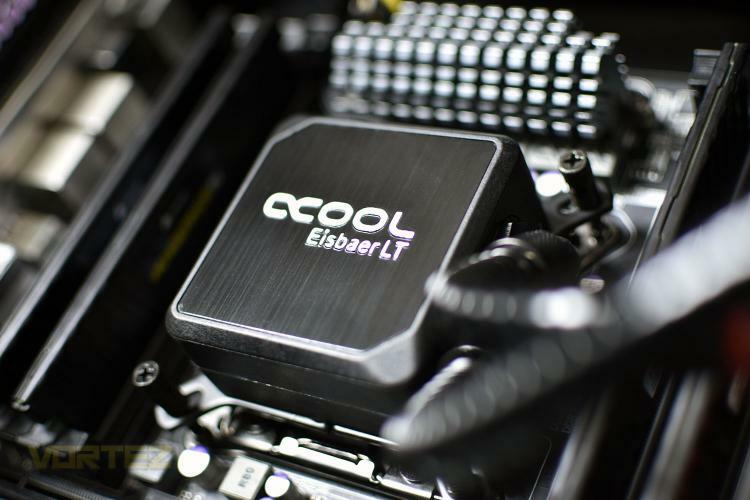 Just like the Eisbaer, the Eisbaer LT distinguishes itself from the usual AIO mix in that Alphacool relied on normal custom components as much as possible during development. This allows the Eisbaer LT to be expanded on not just with the Eisbaer Ready quick connectors but also with connectors using standard G1/4” threads. These can be replaced with other models at any time. Another highlight is the new 25mm thin Slim Radiator, made entirely of copper. Since copper has twice the heat capacity of aluminium, optimal cooling is guaranteed.